This project makes absolutely no sense - hence the name. Created without a main theme or a concept, "Nonsensuality" managed to become probably the most well-known work of imago, presented in numerous festivals, compilations and magazines throughout the globe. It also became the opening piece of Adobe Customer Reel 2005. The video itself is a huge digital recycling project. We took leftover elements from other projects, test footage, photoshop doodles done in spare time and glued them together without any particular order or meaning. We also found a home for some of the animation techniques we have developed, that just didn't seem to fit anywhere else (i.e. the quadruple camera split and merge). 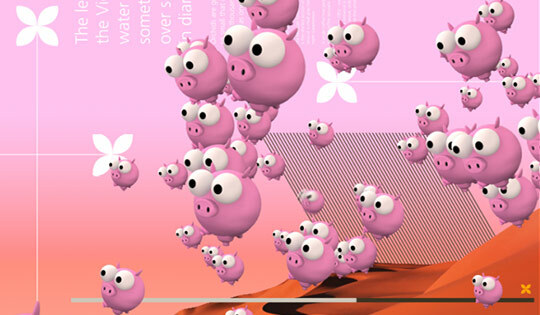 From stylized bloodstream infection through the fields of flowers and birds, stopping by a wood theater only to end up in the desert invaded by flying pigs - don't try to make sense out of it and enjoy the ride.